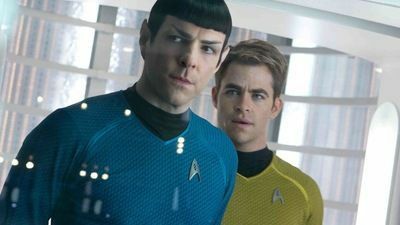 Pros and Khans, or Star Trek into Dorkness: How the new movie reflects a 32-year-old battle for a 47-year-old franchise’s soul. …and Spock and Kirk (2013). 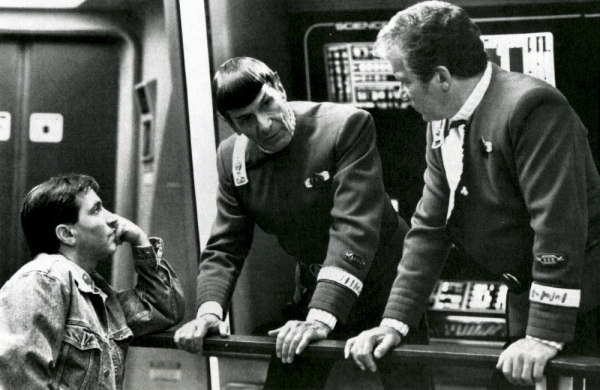 Director Nicholas Meyer with Leonard Nimoy and William Shatner on the set of “Star Trek II: The Wrath of Khan,” 1982. 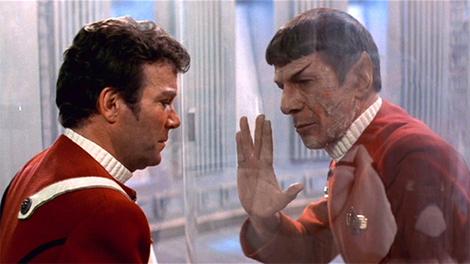 I once attended a midnight screening of the Cadillac of Star Trek films — that would be numero dos, The Wrath of Khan — wherein the projector bulb burnt out right in the middle of Mr. Spock’s heroic death scene. If the theater hadn’t given us four free movie passes to compensate for this effrontery against all that is good and decent, I would’ve suspected an especially cruel prank, perhaps orchestrated by a partisan of the bloodless, squeaky-clean Next Generation-flavored Star Trek, which I suppose is okay if vanilla is what you like. Naturally, I had to dig up my Khan DVD at home and watch the final 10 minutes before I could go to sleep that night. Spock’s grand and tragic expiration would soon be reversed in a not-so-good movie with the surprise-negating subtitle The Search for Spock, but whatever. All of which is to say that my love for The Wrath of Khan is mean and true. And it fascinates me that that film, more than any other of the hundreds and hundreds of subsequent Star Trek items (a great number of which — like the entire Deep Space Nine and Voyager and Enterprise series, for instance — I’ve never seen or read), remains the primary source document that continues to guide the cinematic Star Trek universe, especially in the heavily Khan-indebted new movie Star Trek into Darkness. Poor Me, Pour Me Another: WSC Avant Bard’s No Man’s Land, reviewed. Christopher Henley and Brian Hemmingsen. Allow myself to quote myself: Harold Pinter’s No Man’s Land is a 38-year-old Rubik’s Cube covered in Rorschach blots, a confounding examination of memory and masculinity that resists easy interpretation like an Aikido master shrugging off an unwanted bear hug. I wrestle with that bear — er, WSC Avant Bard’s production of that bear-hug-avoiding Aikido master of a play, that is — in this week’s Washington City Paper. Wrecks & Effects: Folger’s Twelfth Night and Taffety Punk’s The Golem, reviewed. Louis Butelli as Feste in Folger’s TWELFTH NIGHT. Photo by Scott Suchman. No, Elvis Costello has not embarked upon a mandolin tour with Steve Nieve. That’s Louis Butelli, whose performance as Feste is one of the highlights of the Folger Theatre’s new production of Twelfth Night, which I review in today’s Washington City Paper along with Taffety Punk’s spooky The Golem. Grab yourself a copy wherever finer alt-weeklies are given away for free. Why yes, I am pretty goddamn pleased with the party mix I cooked up, at the invitation of managing editor Jon Fischer, for the Washington City Paper’s farewell-to-their-building party on Friday night. 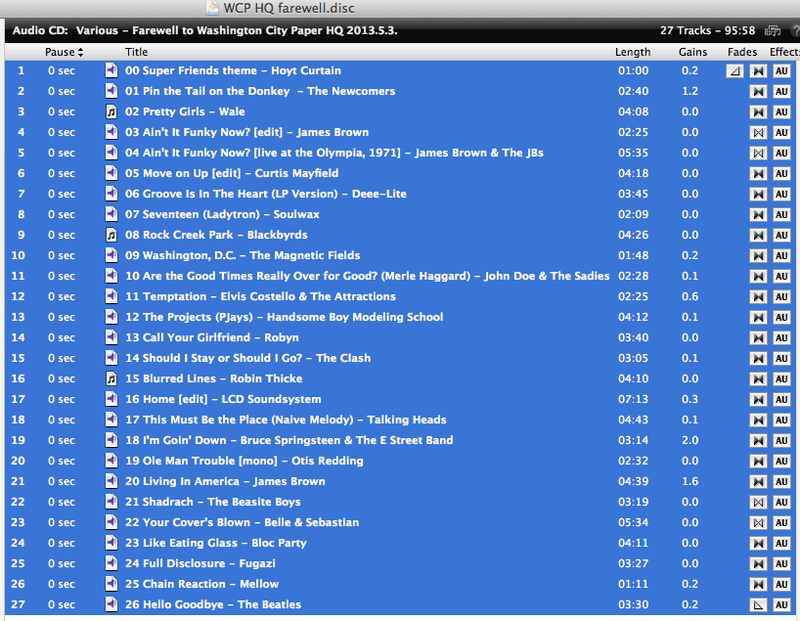 Some local pandering, some classic funk, just a pinch of rank sentimentality, a few reluctant sops to the 21st century. Something for everyone! Who is me or reasonably similar! FULL DISCLOSURE: I am a heterosexual white male in my mid-thirties.